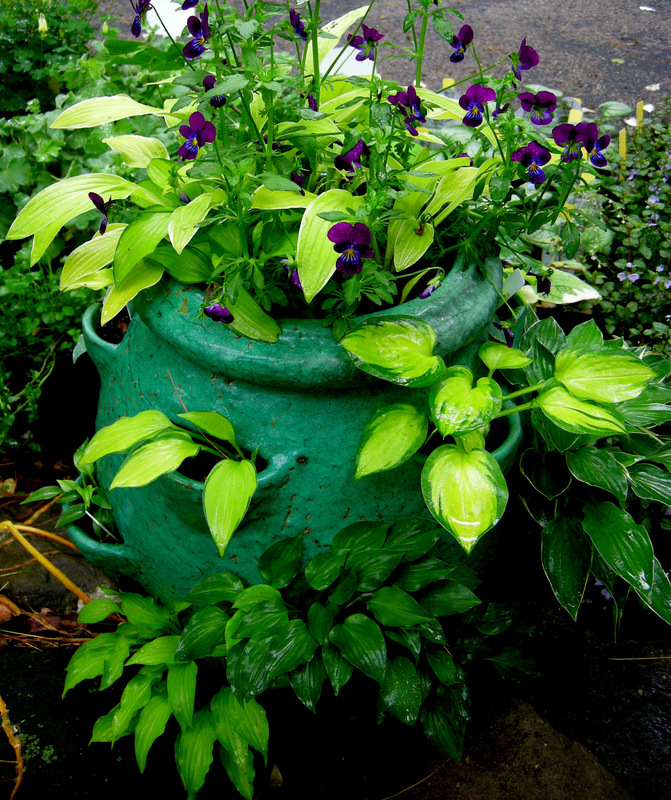 This entry was posted on May 10, 2012 at 6:30 am and is filed under container gardening, containers for shade, hosta, miniature hosta, Shade Gardening, Shade Perennials with tags Athyrium filix-femina 'Minutissimum', Carolyn's Shade Gardens, dwarf hostas, dwarf Solomon's seal, Hosta 'Blue Mouse Ears', Hosta 'Hanky Panky', Hosta 'Itsy Bitsy Spider', Hosta 'Little Miss Sunshine', Hosta 'Praying Hands', Hosta 'Sparkler', Hosta Blonde Elf, Hosta Green Eyes, Hosta Little Blue, Hosta Little Wonder, Hosta Shiny Penny, Hosta tokudama, little hostas, miniature hosta, miniature hostas, miniature lady fern, mouse ears hostas, Polygonatum humile, small hostas. You can follow any responses to this entry through the RSS 2.0 feed. You can leave a response, or trackback from your own site. 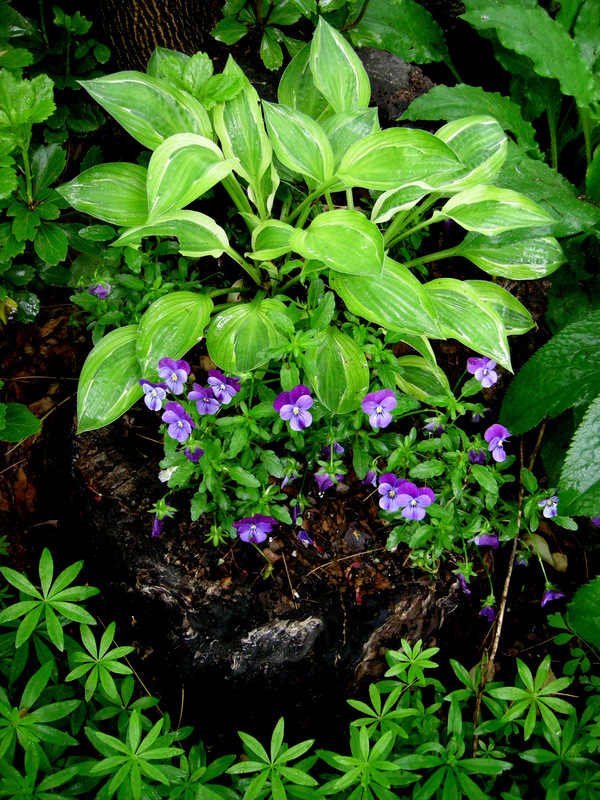 Hostas and violas are a combination I’m going to try. I love all the containers you use. You inspired me. 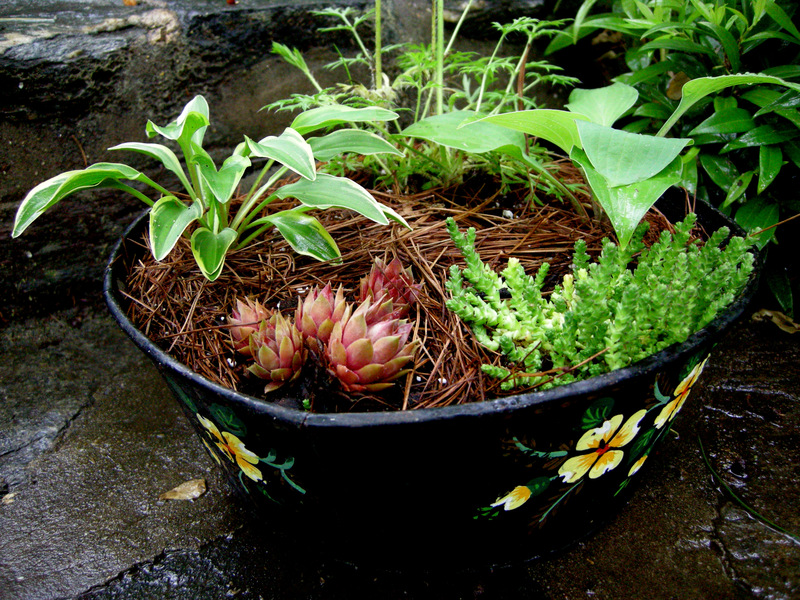 How absolutely gorgeous these containers are – unique and so beautifully designed with plants. Just the right thing to bring interest to any dull corner. Thanks for these ideas! I just love the enamel containers – did you drill holes in the bottom? 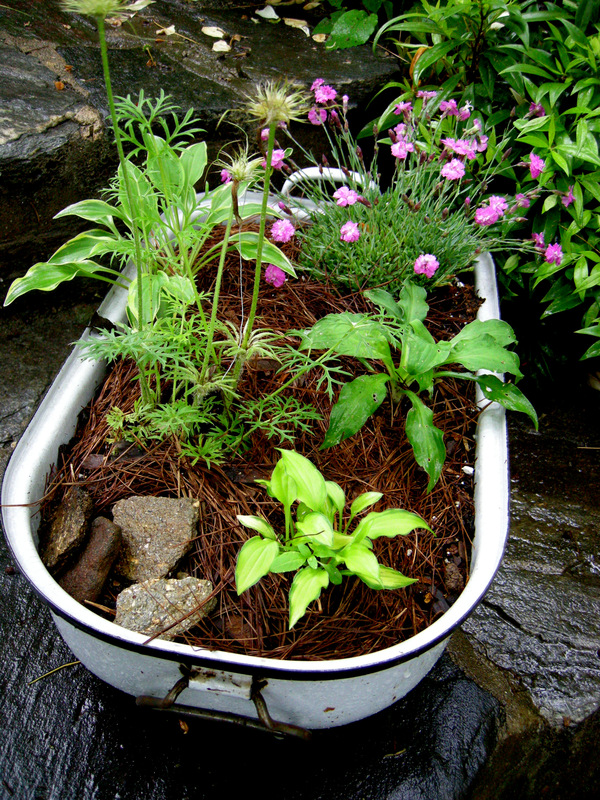 I love these ideas for containers. 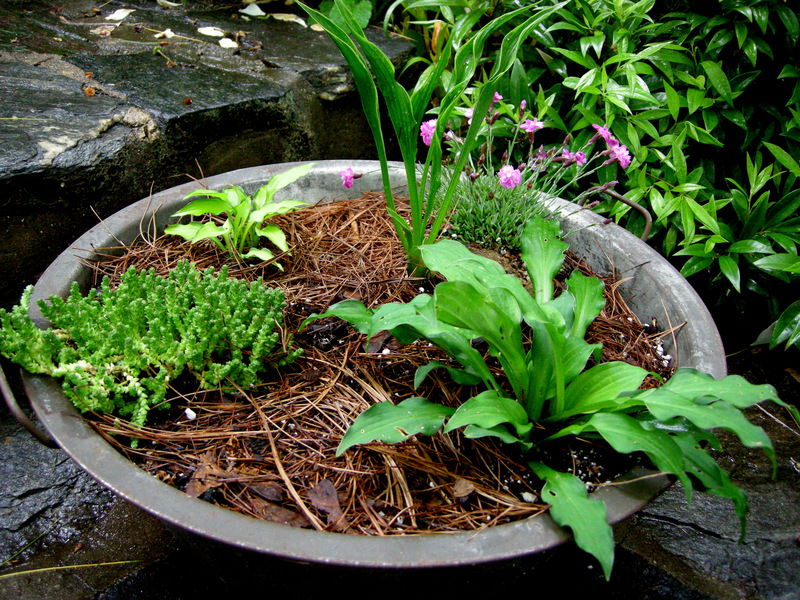 The mini hostas arrived yesterday and I will be planting them in a cement dish container this weekend. They are gorgeous. How interesting! 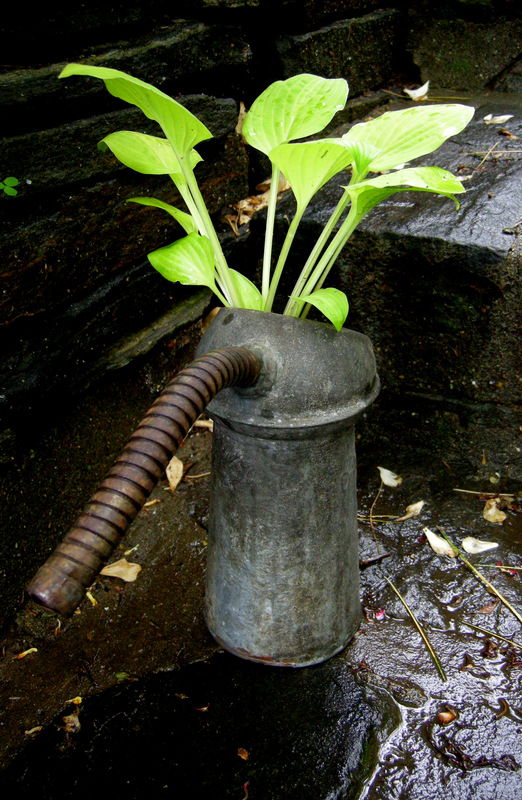 The antique kerosene can is inspired, but my favorite is the pitcher! What beautiful pictures. 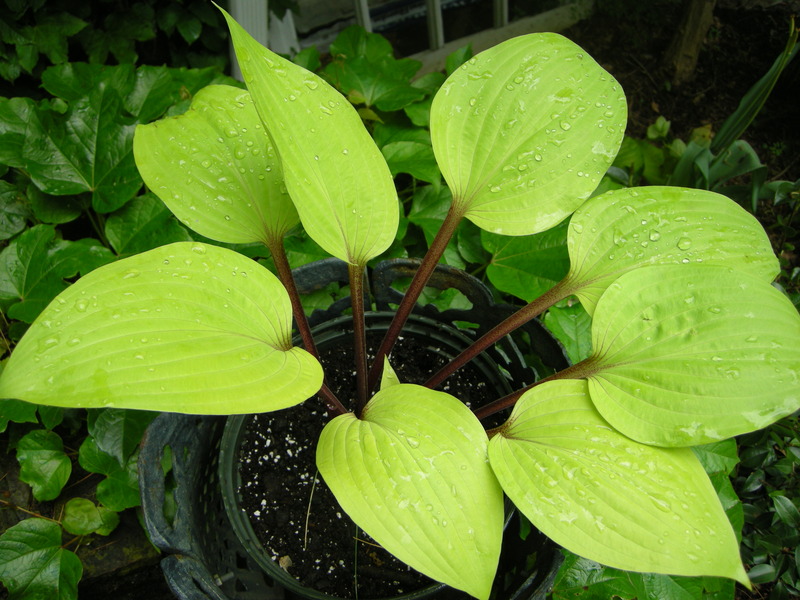 I have a couple of hostas, but they’re one of the few plants in my garden that are actually in the ground. I LOVE the creativity. What can one do with the containers in the winter? 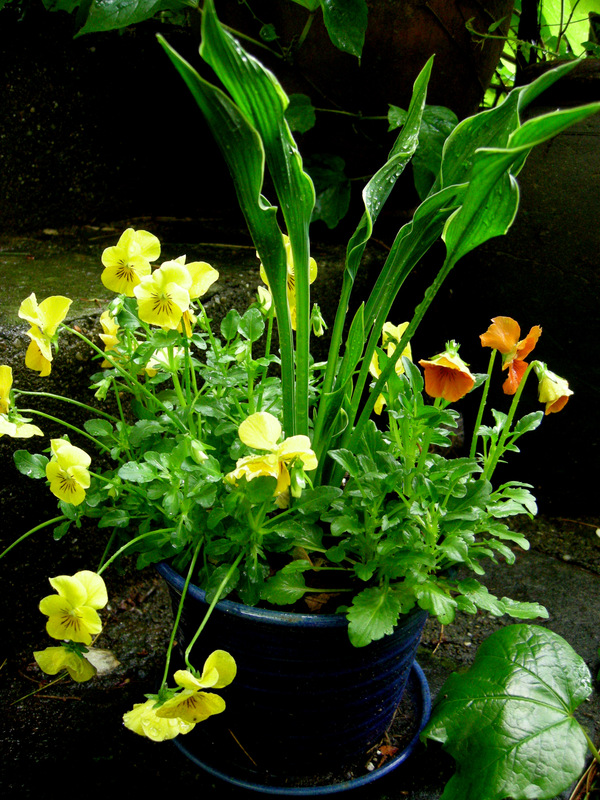 I like the praying hands in the container with violas. I may have to dig up my praying hands and put it in a pot to really show it off. 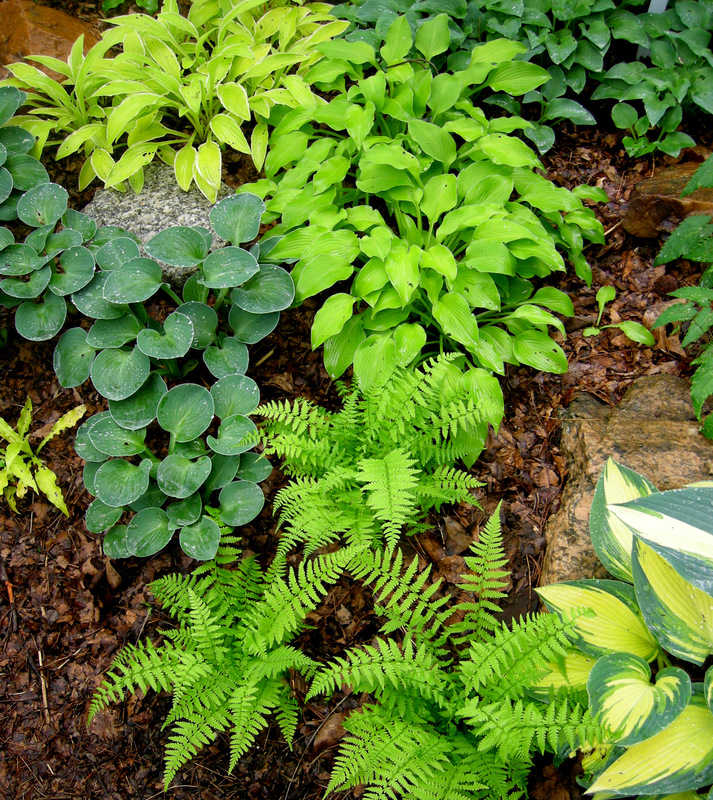 I really like the solomon’s seal, fern and hosta combo. How do you protect your containers over the Winter? Your combos are very well done. I wished I lived closer, as I would probably be a regular. Love the one in the stone trough!! And the violets are just perfect companions. 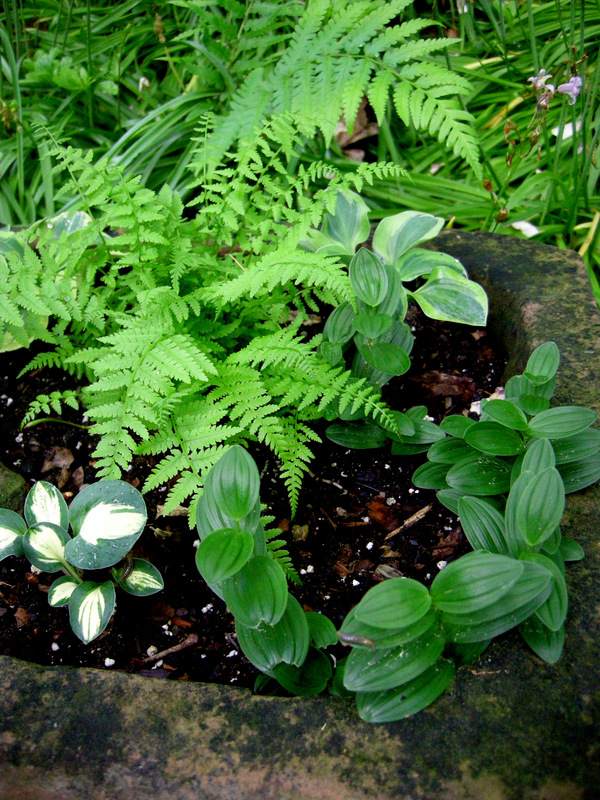 I have been thinking about doing Hostas in containers for a while, but didn’t know if they will tolerate Ohio winters. I see you said you leave yours out but I know you are in a different zone. I guess I should try it with a hosta I wouldn’t care to lose before I buy some of the more valuable ones. 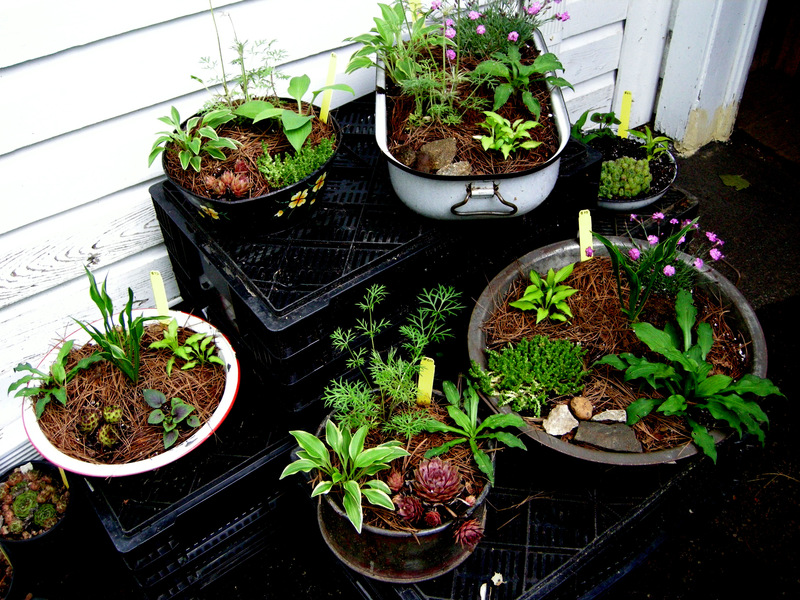 Carolyn, what do you do with them (the hiostas in containers) in winter? I have a shallow fountain base in my shade garden that would make a wonderful planter, but I’m concerned about winter…. it would be very heavy and cumbersome to try to move it to the garage. Carolyn – After reading this post I’m tempted to go outside, dig out my hosta from the flower bed and plant it in a pot. 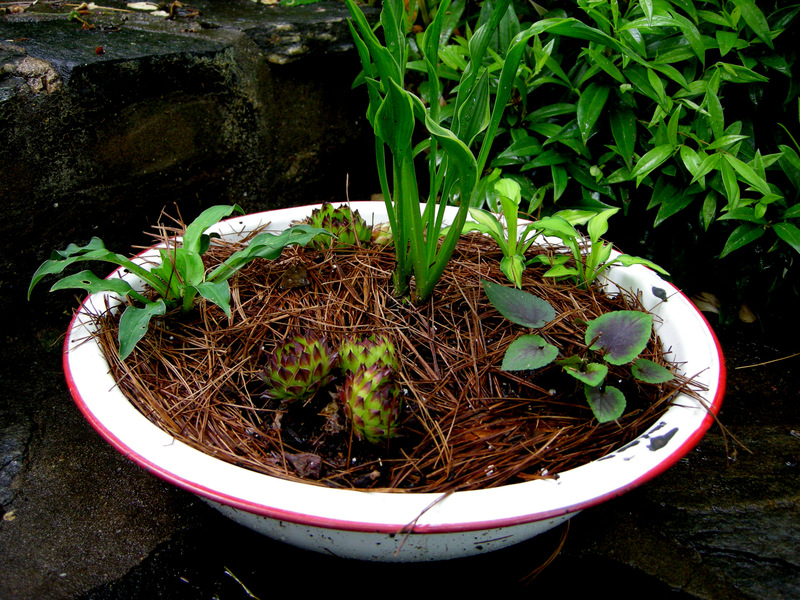 Do you leave the roots in the pots during winter ? I love the miniature gardens! Many are little worlds unto themselves. I also love the hostas in the strawberry jar! I wouldn’t have thought of that. Great idea! Carolyn you asked about my new rain barrel. It will catch rain through the top, but since it is not connected to a downspout, that would be a slow process. I have pre-filled it with water and it will serve as a water reservoir to keep the water handy. Thanks, it is really beautiful. I never get weary of your Hosta posts Carolyn. 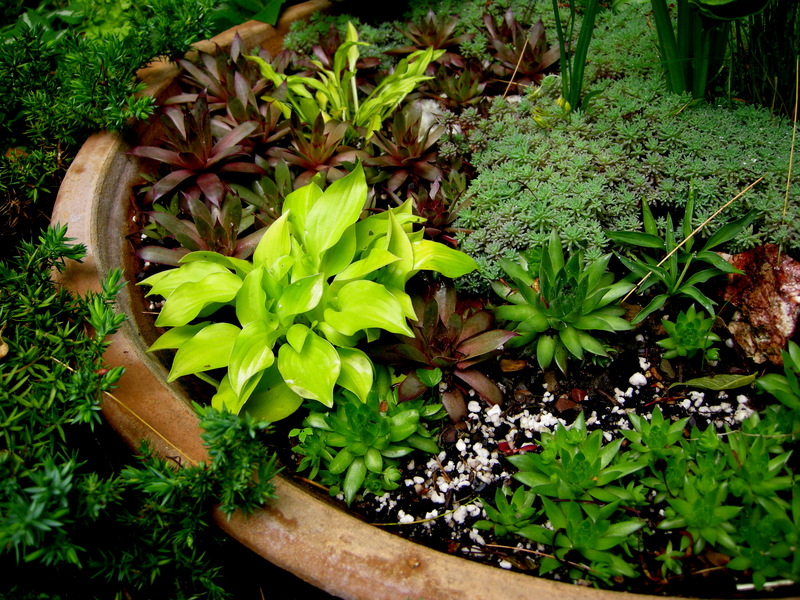 I like them in pots, as well as looking good it keeps the slugs away. Now, I wonder if I also have a pot that looks like an elephant. Carolyn, I love all the old recycled containers. 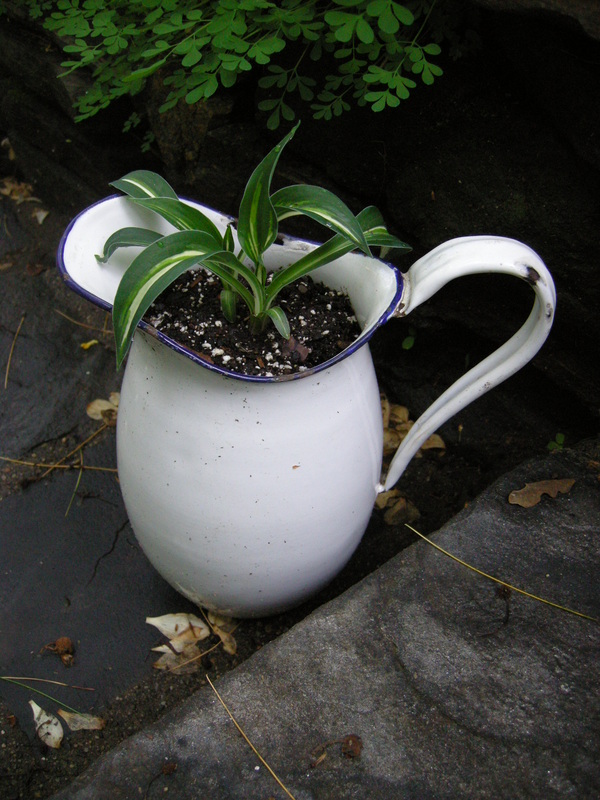 Great way to reuse old items and they look wonderful too. Do you drill holes in the bottoms of the metal containers? What precious hostas. 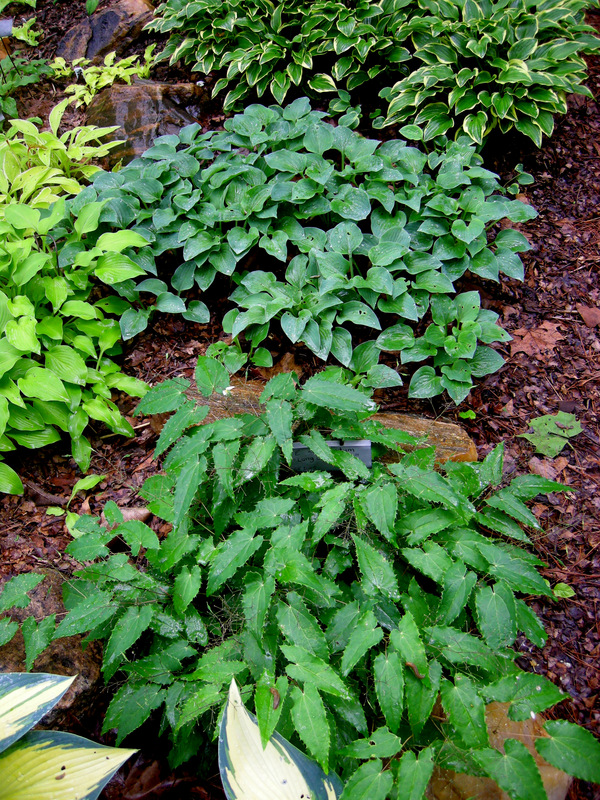 We went to the Shadracks’ when we were at the Buffalo Garden Bloggers Fling and I fell in love with those tiny hostas. In Central Texas with our 70 days over 100 and excessive drought, deer bulb-loving dogs, I have struggled with them. I love the idea of trying them in containers. Look forward to seeing you in Asheville next week. I love these ideas!! I saw the plants Donna bought from you – beautiful Carolyn!! So wish I could order from you :). 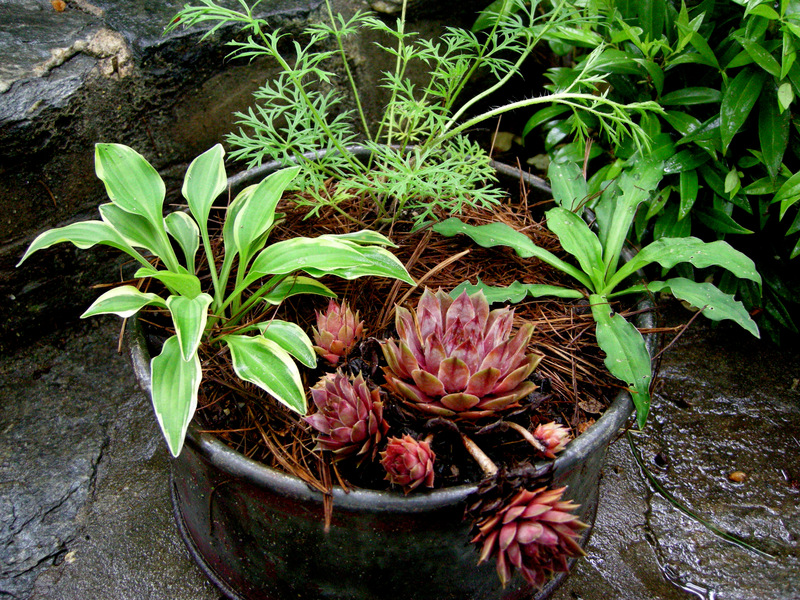 Carolyn, I definitely want to give using small hostas in containers a go. My only concern is overwintering the containers. Do I need to shelter them or protect them in some way? You have given me some great ideas in this post. I like the idea of using a strawberry jar…I have just the one to try. This has been a fantastic series, Carolyn. Carolyn, You have a creative and unique range of planters – assume you make drainage holes in all of them? 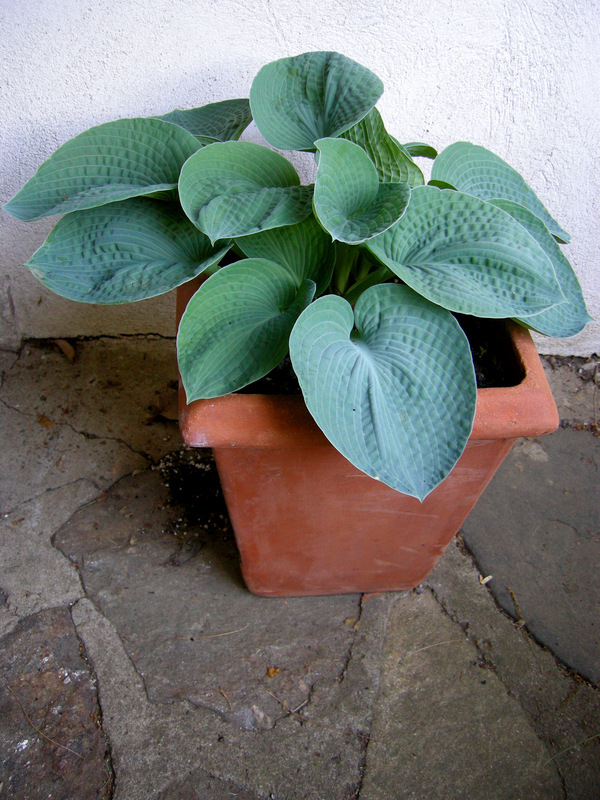 I only keep hostas in pots surrounded by gravel to control slug and snail damage – what do you do about these gastropods? I organic spray with nematodes.